On the roof of the world, a woman is worth a hundred sheep, but the salary of a shepherd is only one sheep per month. Women are scarce because most of them die at a young age during child birth. Abdul Wali is too poor to buy a woman for his son Nematullah. He has decided to sell his eldest daughter, Wulluq Bu, to raise enough money for the wedding. We follow the story of Nematullah and Wulluq Bu for a year, discovering the Kyrgyz community of Afghanistan and the challenges they face. 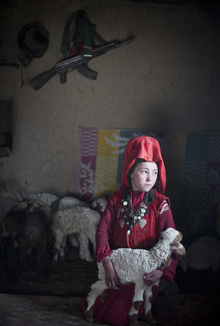 The Kyrgyz of the Afghan Pamir have experienced famine, exile, war and persecution. The only place where they have found security and peace is the hidden depths of Central Asia. Despite the hardships and extremely inhospitable terrain, these people have managed to survive and maintain their traditional way of life against all odds. Prisoners of the Himalayas is their story.